Maximize Your Earning Potential !!!!!!!!!!!! I posted here about earning more and I wanted to follow up to talk about maximizing your earning potential with these online earning sites. At the end of the day it can get confusing but if you take the time to learn and understand the rules and offers on these sites you can really cash in for an extra minute or two of your time. These ideas go beyond the basic search and win and shop for rebates uses of these sites. At MyPoints you can earn 10 points for every coupon you print and redeem from coupons.com page on the MyPoints site. On top of that you can earn 25 bonus points for every 10 coupons you print and redeem from coupons.com, SmartSource,com, or Cellfire. 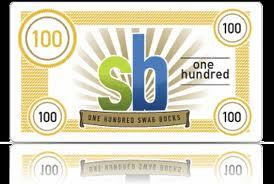 At Swagbucks you can also earn 10 swagbucks for every coupon you print and redeem from the coupons.com page on the Swagbucks site. 1) As you are reading through blogs and see coupons deals and match ups with printable links keep an additional browser(s) open for the site you choose to print from and see if that coupon can be printed from the rewards site first. 2) We can usually print two of each coupon per site, and many of us have access to more than one computer so we can probably print two coupons from each of the sites above- earning us 20 points per site! 3) Pair up with a friend if possible. Perhaps you have a friend who uses diaper coupons and you don't. Print those coupons for your friend, and earn more points on coupons you do not even use! Make sure to return the favor if you friend has coupons that they won't use. Not only are you getting money off your grocery purchase, you are earning additional points! 4) At MyPoints you can translate those points into gift cards at stores you'll be redeeming coupons at, such as CVS, Target, RiteAid, & Walmart. As you can see, once you get started, you can keep rolling those rewards over and over and before you know it you are really maximizing those rewards. It takes 1600 points to get a $10 CVS gift card! At Swagbucks the best deal to redeem is 450 Swagbucks for an Amazon.com gift card. If you use a lot of daily deal sites (more on this below) to purchase gifts or other items, you can redeem 700 swagbucks for a $5 PayPal credit. It is very important to look at the rewards you can earn and have a goal. I just posted here on how to double your budget with daily deal sites and I even realized a few more things since I posted that an hour ago! I am going to try and not recap that post here. I will stress again the importance of budgeting the daily deals and not going crazy on them. Your goal is to save more- not save more by spending more! Groupon deals can be purchased through Ebates for 3% cash back and maybe more on special days, and your local deals from Groupon can also be purchased on your Daily Deals page from Swagbucks. Right now my local deals are worth 315 Swagbucks! That is over halfway to a $5 Amazon credit! Some daily deal sites cannot be purchased through a reward program, but the product you purchase with those deals are often for online purchases so check your Ebates, ShopAtHome, and other similar sites to see if you can earn cash back there as well. If you happen to have a credit or debit card with rewards you can use it to make your purchases through Ebates, Groupon, Swagbucks, etc to earn even more rewards! If you have difficulty keeping track of expiration dates you can write it on a calendar, set up an email reminder or use your reminder system on your cell phone if possible. It can be difficult to remember to check this site and that site and spreadsheets etc. so when I start out I keep a sticky note reminding me to print coupons from this page, or check Swagbucks for this Groupon until it becomes part of my everyday habits. Also, start with one, if it is more important to get save with coupons and earn points start there, after you have mastered that, start incorporating maximizing the daily deals. I might also suggest subscribing to a blog which posts these deals, such as Daily Deal Mojo, Groupon Girl, or another favorite of yours, so you can get these deals delivered to you, instead of spending time searching. These bloggers are spending time gathering these deals and that helps you maximize your earnings by saving you time! If you have any tips to add, please leave a comment! Daily Deal Mojo has a great post about doubling your budget with daily deal sites at Money Saving Mom. This is a must read! Then check out Daily Deal Mojo to read about all the daily deal site offers. I think these daily deal sites can be very helpful for stretching your budget, but I would caution you to set a budget for spending on them, or include them as part of the budget category they fall under. Personally, since these can be used for gifts, groceries, eating out...well, just about anything....I am making a budget category for them and I will filter a few dollars from my grocery, entertainment, gift budgets, etc. I am also considering taking any leftovers from the budget categories and moving some into Daily Deals budget, and the rest to savings. Also, do not forget to check Ebates (or other rebate shopping sites) to get your cash back on these purchases! You may want to think of devoting the cash back from those purchases into the Daily Deals budget line. I think this can be a great budget stretcher, but caution you not to go overboard! Last month I was able to cash in 2 $5.00 Amazon.com gift cards and those were eligible to be redeemed this week. I currently have $15 in gift cards on the site,and I spent $13.00 last week. It was really nice to know I could purchase something I wanted with no money! I've already been looking around the site for a wish list of things I need, maybe want as well. I would really like some new chef pants for school, and am trying to plan in advance for the upcoming birthday season in our lives. Birthdays around here start in Spring and end around Fall. Penny at The Saved Quarter posted about a $100 Holiday Challenge this year and they are making these rewards part of that. I like that idea as well. You can shop as you earn or stockpile the rewards until fall. One thing about redeeming Swagbucks: You can only redeem points for 5 of the same gift per month. As you can calculate you are not going to get rich but you can make a great dent in your budget. The Amazon cards are the lowest amount of points you can redeem,so more bang for your buck. The next best one was a $5 Paypal credit for $750.00. I am going to be writing some more posts about earning and how I keep track of what I am earning, and what is due to me...Happy Earning! Money Knowledge: Where is it going? I do not know if I am unreasonably frugal or the deals are leaving little to be desired. I have had to step back and take a good look at my finances now that we are living on one income and I am a student. I have also been working to change the way we eat and this does not seem to “match up” with coupons & sales as much anymore. Maybe that is why you have not heard from me…at all. I am trying to eat more fresh fruit & vegetables, and foods like quinoa (keen-wah), and taking my vitamins. So, how am I “Shopping Without Money”? I am focusing on keeping track of my spending on a simple Excel spreadsheet. For the month of January I saved all of our receipts for gas, groceries, and little expenses. I made categories such as Food & Non-Essential Food. Non Essential food is chocolate, coffee, etc. Things we don't need but like. I added a category for Groupon and alike spending as well. I want to see if I am saving money here or if it is costing me money to save money! We can get caught in that trap very easily. When all was said and done for the month of January we had spent $129.00 more than we made! I believe that my math is off a little. We do not EVER use credit cards so I am wondering how this happened. My bank account is in the positive. I think I counted money spent on gift cards that we had, we had $150.00 in Walmart gift cards so I used those for groceries last month ( I spent more on groceries that $150.00). Here is where keeping this spreadsheet helped me: If I had not had those gift cards would I have overspent anyway? Would I have put my bank account in the negative, costing myself even more money? Now I have a starting point- I can see the categories where I spent too much, and work on reducing those. Already today I switched to a cheaper cable package with a lot less channels. I have found that the TV is rarely on, and after a bit, we won't even remember the mindless shows we were watching. I also called my credit card company on another matter and was informed that they have a new program where I can earn 20% back on any payment above and beyond my minimum payment. The 20% goes toward paying down my balance- it is not toward airline miles, etc. Next on the list is researching my cell phone bill and data plan. So get an envelope ready for receipts, and use pen & paper or Excel, or something, to start keeping track of expenses! One of the things I was on my soapbox about in this post was the high price of peanut butter. There is not much to making peanut butter so you are getting just the picture above. I know, my creativity is just too much for you isn't it? 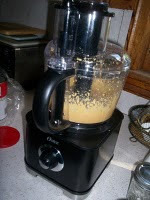 Well, here is how you make your own peanut butter: find some peanuts that you like, put them in the food processor (or blender), and blend until smooth or as chunky as you want. I did need to add about a teaspoon of vegetable oil to get the peanut butter as smooth as we like it. I bought dry roasted unsalted peanuts that were mu local store brand. I paid $4.79 for 2 lbs of peanuts and I am expecting that to make me 3 small or two large jars. I also bought some natural almonds and made some almond butter. I believe I bought the bad they sell at Aldi for $5.00 to use as a test bag, and now that I know it works I might look for a source of natural almonds that I can buy in bulk. The almond butter is a little thicker than peanut butter but I love it on a whole grain english muffin for breakfast. It keeps me full for hours! The other factor to include in this is I can make more healthy nut butters. For example I can add ground flax, etc to get more omega 3's. It may be a way to sneak some vitamins in if you have picky eaters. You can add sugar if you want to, I don't, but I know your children may not eat it without sugar. After eating it once or twice I really did not notice the lack of sugar anymore. Maybe you can add some and decrease it with each batch until the family is used to it? I store the butters in a glass jelly jar or larger canning jar in the refrigerator. I have not tried to can it in a water bath yet but plan to try, i will have to let you know how that works out. If you give it a try please leave us a comment! Make it Yourself Monday-on Thursday! I think you all know by now I am not the most consistent blogger, and I started school this week which is making me even more tired! Yes I started school on Tuesday, I am going back to college to be a pastry chef! I am so excited! Anyway the picture above is from my niece's 5th birthday party. She loves Strawberry Shortcake and I offered to make her cake. I looked online for ideas and found mostly character cakes made from character pans but I wanted something different. 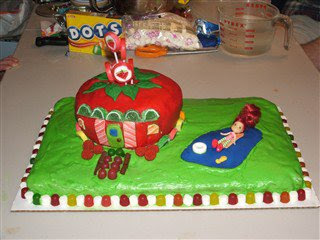 Between the two of us we settled on a cake that looked like a strawberry with a Strawberry Shortcake doll next to it. I decided to surprise her and make Strawberry's house. This is not an exact replica, but she knew what it was and she loved it, and I had fun making it for her. Not to discount my work, but it was not very difficult to make. I spent about 5 hours on the entire cake- including the sheet cake underneath(more pictures to follow). 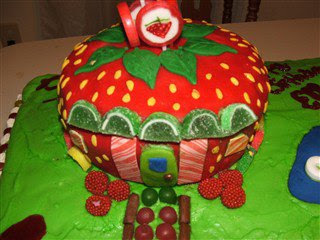 I decided to make the strawberry by cooking a cake in a glass bowl - you can use a mix or make it from scratch. This actually came out quite well, he cracks on the top as the cake cooked naturally formed the cake into a fat little strawberry shape. Then I bought a small bucket of red fondant from Michael's, and I used those 40% off coupons in the paper. Also, every time I make a purchase it seems to spit another coupon out, and no one seems to have an issue with me going through the line a few times. Fondant is not as hard as I thought- you warm it in the microwave according to the package directions and roll it out- I used a regular rolling pin, not a special fondant pin. I made sure it was large enough, and laid it over the strawberry, then I cut excess off the bottom, and smoothed lines with warm water. I used a simple leaf cookie cutter for the leaves, and rolled yellow fondant into tiny seeds with my fingers- that took the longest! Then I just let my imagination get carried away! I used candy from the dollar store and from my sister's stash to decorate. All I did was look up a photo online of the toy, and used my niece's toy as a model, and did my best. I used little raspberry candies for bushes, and tiny butterfly sprinkles in different spots on the flowers and leaves. Tootsie Rolls cut in half and dots are the walkway. Next to the house I rolled some blue fondant into an uneven shape and laid it out as a pond. I made a little fish from yellow fondant, and a lifesaver raft. I also took a stick of gum, rolled it on top to make a headrest, and made a raft for Strawberry Shortcake to swim in her blueberry pond! I am not quite comfortable yet making characters out of fondant or frosting, so I used my niece's doll as a decoration. Are you still scared? Don't be. This is a great way to wow your child and you do not need to spend a lot of money. If you keep a well stocked pantry of ingredients or cake mixes bought with coupons you can save money right from the start. My sister keeps a basket of all of the candy the kids get from parties and goody bags, and you can do that too. You can purchase frosting and other items at stores like Michael's, Joann's, and AC Moore with weekly 40% off coupons. It takes just as much preparation in advance as it does to shop your regular weekly store deals. As for fondant, I discovered this past week that if I have trouble molding it myself, I can use a cookie cutter, or a candy mold. 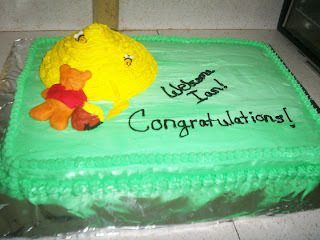 This past week I made a Winnie the Pooh cake for a baby shower. I was really stressing about the Pooh Bear. What I decided to do was buy a large 3 inch teddy bear cookie cutter for 99 cents and color fondant with food coloring, and not roll it out. I used the cookie cutter to cut the bear thick and then I added more fondant for his tummy and his snout. I used the bear cutter again to cut some red fondant left over from the strawberry to cut out Pooh's red shirt. I used left over yellow to make tiny bees, just by rolling them with my fingers, and placed them on with a toothpick. I used black writer icing for the stripes, and some white fondant to make wings. I used a giant cupcake pan to make the beehive -I just used the top part of the cupcake and frosted it yellow! Now, had I thought a little more in advance I learned I could color my fondant with frosting coloring, and pop it into a candy mold to make flowers, leaves, etc. That is the point of this, you learn as you go! I encourage you to try some fun, creative new ideas for Halloween or the Holidays, and use the Wilton website for inspiration and assistance. I will post more cakes and ideas as I go....good luck! I won't spend a ton of time repeating what I wrote in the post below labeled Make it Yourself Monday, but I will encourage you to read my thoughts and get a little more perspective on why I am making some changes in life. I've been struggling for a few months with the balance between couponing and buying healthy foods for my family. Yes, there are coupons for healthy food, but not a lot for the foods I want to buy. For example, I like to eat peanut butter with no sugar. 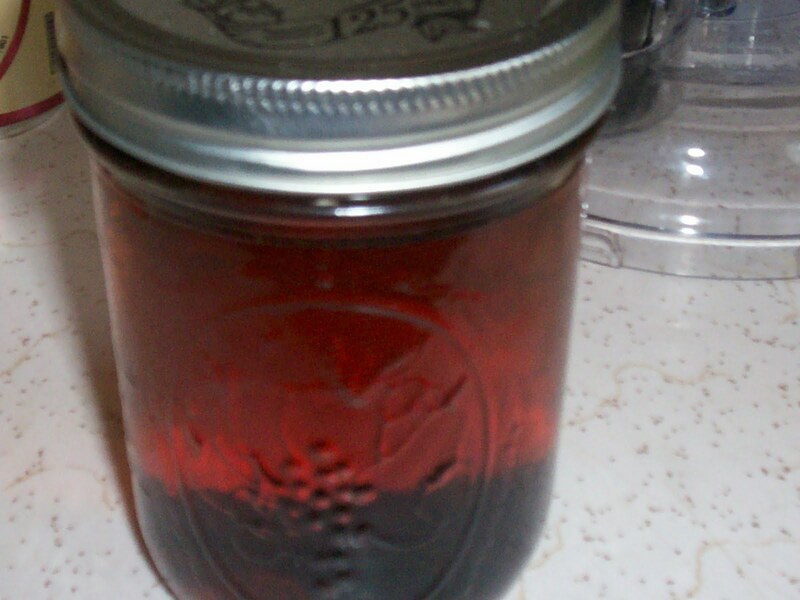 I have been buying it from health food stores, or farmer's markets, at a cost of $7.50 per jar. I have also purchased Skippy Natural which is low in sugar for almost $4 per jar. It took me some time but I figured out I could make my money go farther by purchasing bulk peanuts, with not salt, for about $7.50 and make several jars of peanut butter! Most coupons for peanut butter are 75 cents off two, not saving me much money and it still has a little sugar so I am not even getting exactly what I want. I am stretching my food dollars and getting healthy, fresh, wholesome food at the same time. Most of the time it is as simple as searching on Swagbucks for a recipe and then I can earn points toward gift cards at the same time! Another great way I have been saving money this summer is shopping at the farmer's market! How tired are you of me preaching about this? I've been able to buy produce in bulk for cheap and have been canning it to have for winter when prices on produce are sky high and they are shipped from hundreds of miles away. Don't you just hate it when you buy lettuce at the store and it is rotten in two days? It makes me crazy! I may as well throw money in the trash! You can also do this by purchasing fresh produce on sale at the grocery store and canning it. Check out Fresh Preserving's website - there are a ton of recipes and I was surprised to find I do not need to add salt to most vegetables to preserve them! For me, I am able to spend less time clipping and organizing coupons, and shopping for deals. I spend less time because I am not traveling from store to store all the time. That may not be a benefit to you, but it is important to me. I still seek out great deals on other products, like shampoo, toothpaste, cold medicine, etc. Much like couponing though, once I master cooking from scratch and canning, I plan to begin making all natural cleaning products from scratch, as another layer of this natural lifestyle I am trying to achieve. I hope that you will join us and learn a few new things! Oh, and by the way, in order to make my own peanut butter I just place peanuts in the food processor and process until they turn smooth-and you can make them as smooth or chunky as you like! I, along with my sister have, have been making a conscious effort this summer to buy organic from the local farmer's market. It has been really wonderful but it has sparked something in me to start eating more organic and homemade products. A few months ago I saw the maker of the documentary Food Inc. on the Oprah show. Oprah discussed the fact that our foods have so many preservatives, and added hormones & antibiotics than the food our grandparents ate. This really stuck with me. The last time I felt really well and healthy I was eating organic foods, and meats with no added growth hormone I lost 50 pounds, and slept like a baby! If the thoughts above are not currently a high priority for you, let me appeal to your money-minded side, which is really what this blog is all about! I decided to make a small jar of vanilla extract as a test, and if this comes out well, I am going to be using it to give as gifts for the holidays, most likely in some gift baskets with other homemade items like peanut and almond butter. I used a canning jar since we have so many but you can find many jars at garage sales, thrift stores or Dollar stores. I took a whole vanilla pod, split it lengthwise, and cut it into several pieces. I estimated an entire pod based on recipes I had seen, like one vanilla bean to 3 tablespoons of vodka. That was not enough for me to make. I added almost a full canning jar of Grey Goose that had been given to us as a gift. Now, I just shake the jar every day for 4 weeks, after that you can strain it and bottle it. Since I estimated I will taste it after 4 weeks and add more vanilla beans if needed. This will give me plenty of time to have this ready for Holiday gifts. Here are a few recipes that can fit multiple needs. Enjoy! What Are you Waiting For???? Join MyPoints already!!!!!!!!!! I have been earning money through MyPoints for a little over a year now. 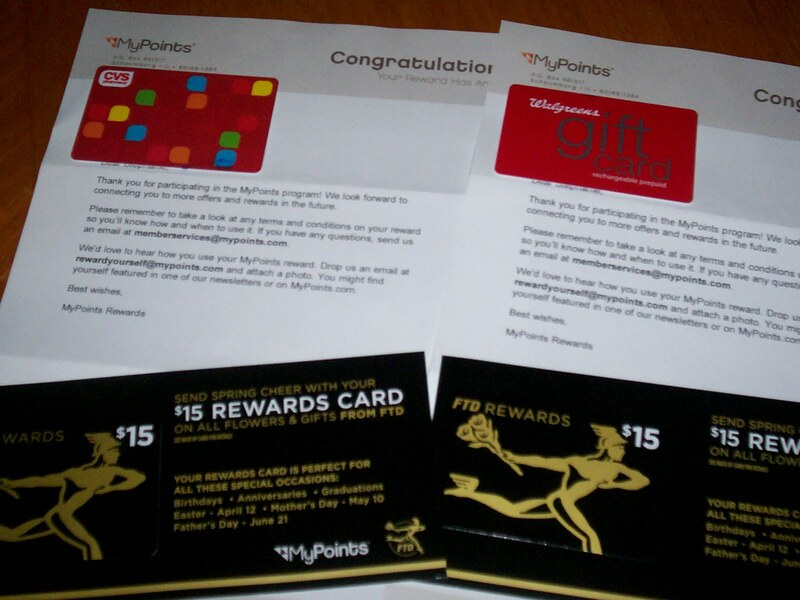 Above are two gift cards that I redeemed point for last year and the bonus FTD gift cards that came with them. 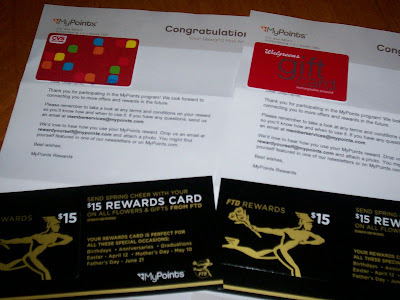 I would estimate that in about 30 days time I earn enough points for one $25.00 gift card or two $10.00 gift cards. It does not stop at CVS and Wags either! You can redeem points for Pottery Barn, Old Navy, and all of their friends! Questions about this transaction? See all related transactions. | Contact member services. I am saving my points- hah, no pun intended-for Christmas shopping. I think I will redeem at the beginning of November. The last time I redeemed points the cards arrived within days. I almost forgot to tell you, you really have to keep me on track! MyPoints has now added a PrePaid Visa card, so you can shop at multiple stores!!!!!!!!!!!!! So, I do have one little favor to ask you to pay forward??? Post a comment here or send an email to shopwithoutmoney@gmail.com and let us send you an invitation to join? Hellloooooooooooooooooo?????? Did you hear me? Send us an email or post a comment! Then invite your friends to join so you can earn even more points!